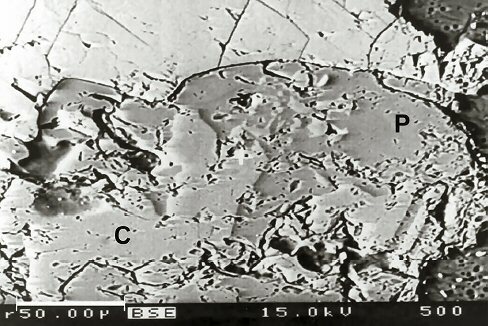 Comments: Backscattered electron (BSE) picture of pertsevite (P, darker grey) partially replacing clinohumite (C, lighter grey). The still lighter grey mineral with cleavage at the top contacting only pertsevite is calcite. (Eur. J. Mineral, 15:1008). Location: Contact-metasomatic kotoite marble from the region east of Verkhoyansk, Sakha-Yakutia, northeastern Siberia..